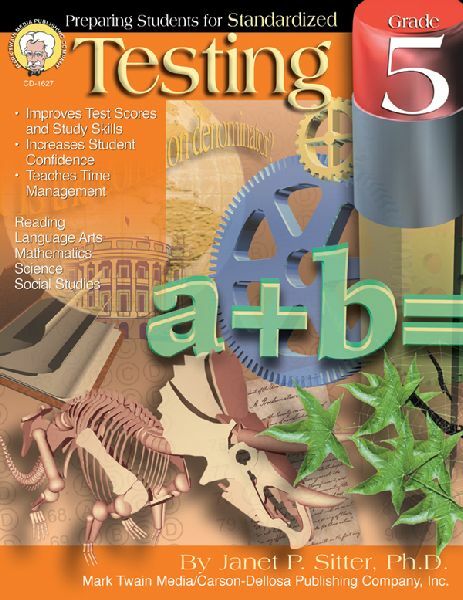 TheReadingWarehouse.com:Preparing Students for Standardized Testing, Grade 5:Janet P. Sitter, Ph.D. Author: Janet P. Sitter, Ph.D.
Annotation: Familiarize students in grade 5 with the format and language of standardized tests using Preparing Students for Standardized Testing. This 128-page book is organized in a clear, concise way so that the lessons and tips build students' confidence and practice tests support skill reinforcement. This book covers topics such as vocabulary, language mechanics and comprehension, math computation and problem solving, scientific process, history and culture, government, and geography. The book includes reproducibles and an answer key.